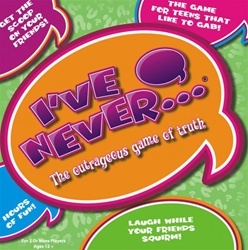 â€œIâ€™ve Never...Â®â€� is the hottest, funniest, and most exciting party game ever! Secrets will be revealed! Embarrassing consequences will follow! Everyone will be talking about this game! Are you ready? It only takes 5 minutes to learn, but you will play for hours! As you roll the dice and move around the board, you may have to dance, sing, imitate your best friend, spin 5 times in a circle, and answer outrageous "I've Never...Â®" questions. OMG!! Are you kidding? Next question please. What's a good occasion to play this game? When would you not want to play this game?! You can play this game just about anywhere: at birthday parties, slumber parties, school socials, dance parties, summer camps, road trips, you name it. Can boys and girls play together? Yes, this is a fun game for everyone. What if my mom or dad walk in while we're playing the game? Not as much as that person sitting next to you! !